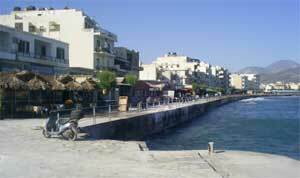 Ierapetra on Crete: Travel Guide about Sights, Accommodation, Restaurants in Ierapetra. Chrissi Island, Mirtos and Koutsouras. Ierapetra is based in the South East of Crete, and is the most southerly town of Europe. The dry, warm winter climate attracts many visitors in winter, some of whom stay for the entire winter. The town has a lovely atmosphere, if somewhat muted and rural. There is no mass tourism here comparable to that on the north coast, but you’ll find many expats from Britain and Germany living in Ierapetra and the surrounding areas. Many people come also on a day-trip from the gig tourist town not far away on the north-coast like Agios Nikolaos or Elounda. Sights in Ierapetra: It’s definitely worth taking a look around Ierapetra’s charming old town. There are many small alleys, some of which are too small for cars, and it’s easy to get lost. 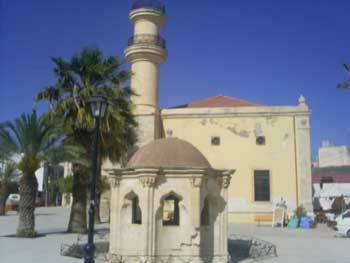 The ‘must-sees’ of Ierapetra are the mosque, the fishing port and the 17th century castle. There is also a small Archaeological Museum (closed for renovation in the year 2017, maybe open again 2018 oe 2019) in the old town. The most famous exhibit in the museum is the 1.5m Madonna of Ierapetra. This 1st century stature is well preserved. The Madonna was discovered by a local farmer, who also uncovered many ancient vases, sarcophagi and pots. 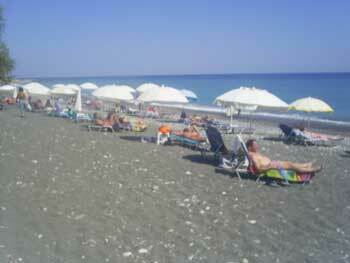 Accommodation in Ierapetra: There is no campsite or hostel in Ierapetra. The nearest campsite can be found 8 kilmeters to the east. You can reach it by taking the bus for Sitia. It’s a fairly average campsite, complete with a small show and simple restaurant. 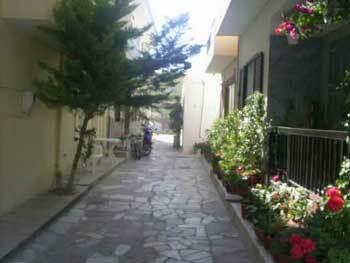 Cheap rooms can be found in Ierapetra around the old town and near the bus station. I stayed at the Hotel Coral in the old town a few years ago and I can recommend it. 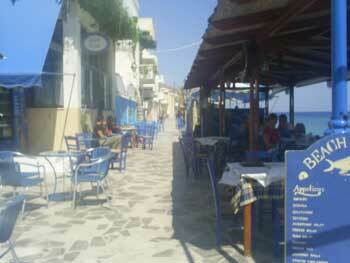 Castello is a good, cheap restaurant in Ierapetra that can be found on the waterfront close to the old town. The Café and Teahouse Cactus sell a huge range of organic teas from around the world for around €2 a cup. There’s also a bookshop, called Fasma, which has a good selection of English books. Buses Ierapetra: There are 6 buses daily to Iraklio with a stop in Agios Nikolaos. There are another 6 buses in the other direction to Sitia. The bus station is 1.5 km to the north of the old town. There are also some buses every day to Mirtos and Makrygialos (with stops in Ferma and Agia Fotia). Heraklion to Ierapetra with stop in Agios Nikolaos: 07:00 , 08:15 , 09:45 , 11:45 , 14:45 , 16:45 , 19:45. The bus at 8:15 does not leave on Sundays, all other bus-connections are daily. Ierapetra - Agios Nikolaos - Heraklio (daily): 06:30 , 08:30 , 11:15 , 14:15 , 16:15, 18:00, 20:00. Ticket price: Heraklio one way about 11 Euro or 22 Euro return. Travel time from Ierapetra to and from Heraklio about 2,5 hours. Some buses stop at Iraklio airport. Timetables change often in Greece. 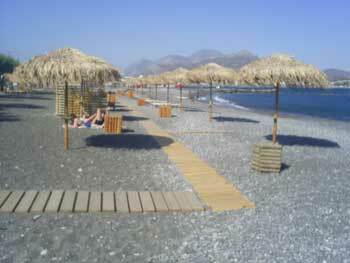 Chrissi (Hrysi) Island: Chrissi is a 5km long island a few kilometres offshore from Ierapetra. Chrissi is uninhabited in winter. It’s also a nature reserve. The island makes for a wonderful day trip, with good hikes and great beaches. All through the season, from May to October, there are daily boats from Ierapetra to Chrissi. You can buy tickets at any travel agency, at the port or directly from the ship. Koutsouras: A small town 20km east of Ierapetra. 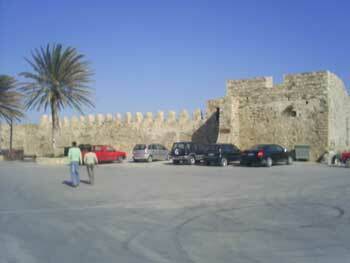 Koutsouras has been discovered by the tourist industry and is being developed. It’s well worth coming here in spring to see the Valley of Butterflies – you’ll see a magical sight of millions of butterflies. The Ierapetra-Sitia road passes through Koutsouras. Not far from here is Pandeleimonas village which has a famous Byzantine church, one of the oldest on Crete.